The Swansong concerts continued with Consort Pleon joining us at St Mary’s in the village, on Wednesday 26th September, when they offered a performance of English Baroque music from around 1600 – 1750. Apparently, Pleon is an old English word meaning to venture or take risk. They are a group formed in 2009, from musicians at Birmingham Conservatoire and The Royal Academy, London. The audience of approximately 50 folk, assembled for a thoroughly enjoyable performance of this period music in the majestic surrounding of St Mary’s Church. The musical compositions were from Henry Purcell – Sonatas No 4 in F and No 3 in G minor, together with ‘Music for a while’ (Z.583) 1692 – ‘Sweeter than Roses’ from Six songs by Purcell (Z.585) 1695. Together with Matthew Locke – Suite No 5 in F minor the Little Consort 1656 and Suite No 3 in C major the Broken Consort c 1660. Jon Blow – ‘Poor Celadon’ (Loving above himself) from ‘Amphion Anglicus’, 1700 and Robert Parsons – ‘Pour down, you pow’rs devine’ (Pandolpho) 1535 – 1572, also an anonymous piece called – ‘My little sweet darling’. The musicians Sara Wilander – Harpsicord, Cello – Lucia Capellaro, Violins – Katarina Dordevic and Guy Noel Clarissa, were ably accompanied by the Counter Tenor Meili Li, who all received our extended acclaim, to which they treated us to an extra finale.The chuch setting gave the evening a sense of timeless grandeur and the accoustics of the building lent themselves perfectly to the music style. Thanks go to Mike Byrne, former librarian in Acocks Green, for continuing to organise such delightful evenings in our neighbourhood and to Revd. Andrew Bullock for welcoming the musicans and audience so warmly. The next Swansong concert will again be at St Mary’s Church on Wed 21st November at 7.30pm with the CBSO Baroque Players. Free entry, contributions at the end. Everyone welcome. 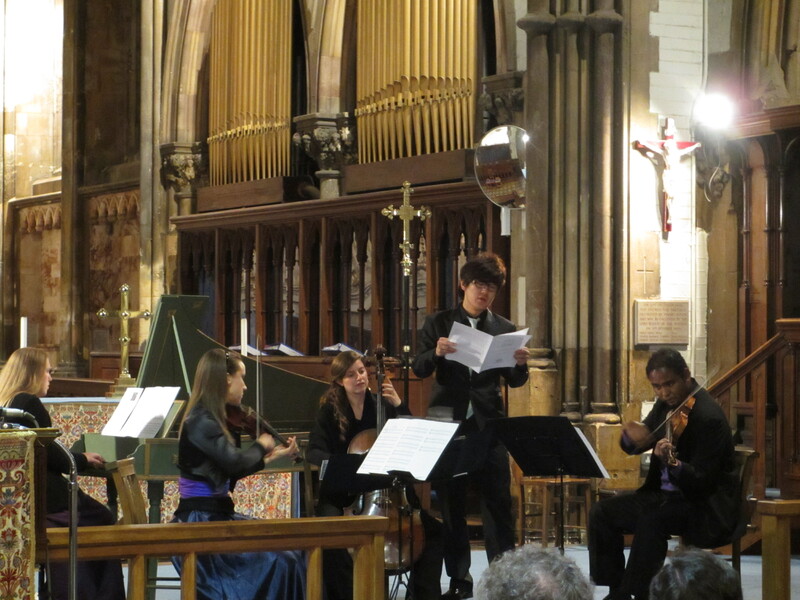 This entry was posted in Events and tagged Acocks Green, Baroque music, Birmingham Conservatoire, Consort Pléon, Henry Purcell, Katarina Dordevic, Lucia Capellaro, Meili Li, Mike Byrne, Revd Andrew Bullock, Sara Wilander, St Marys Church. Bookmark the permalink.